The Lumbar Nook is the smallest accessible area in Bowser's body, located in Bowser's lower back (or specifically, the lumbar vertebrae, hence the name). 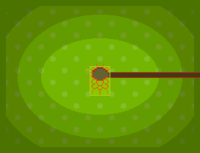 Rejuvenating this area after Bowser suffers back pain allows Bowser to learn spike ball. 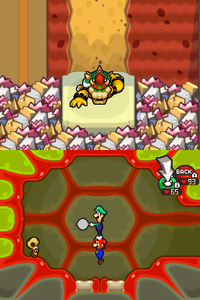 During the events of Mario & Luigi: Bowser's Inside Story, Bowser is tricked and trapped inside a safe and thrown into a junkyard on the premises of Peach's Castle. When Bowser is released from the safe after Mario and Luigi defeat Junker, he is incapacitated due to back pain. The brothers re-enter Bowser's body via a pipe in the castle and travel to the Lumbar Nook, where they spin drill into the soft spot between the bones. By doing so, the brothers slowly heal Bowser's back pain (the player is instructed by Toadsworth and Toadbert to leave the Nintendo DS alone during the healing process until an alarm sounds), then the two Toads have tea. 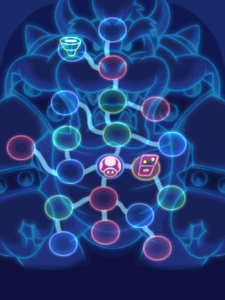 After the healing is finished, Bowser is rejuvenated and becomes more flexible, allowing him to learn the new move spike ball. It is possible to speed up the process, so that the player does not have to wait very long at all. By talking to Toadbert in Toad Square after defeating Bowser Memory ML, he will tell Mario and Luigi that he was having a weird dream, which foreshadows the event in the Lumbar Nook. He mentions a code: " ". When this code is entered, time speeds up and Bowser's back is healed in seconds. The Japanese name for the Lumbar Nook is Koshi no Tsubo, roughly meaning "Lower Back Acupoint." Acupoints refer to the specific points on the body where needles are inserted in order to relieve pain. Thus, it can be inferred that Mario and Luigi's method of treating Bowser's back pain (by spin-drilling into the soft spot) is a form of acupuncture. This page was last edited on October 6, 2018, at 09:41.